That's a big old pile of cheese right there...come to mumma! Cut the top rind off all 4 cheeses, and the base rind off 3 of them. Stack them on top of each other, so the one with the base rind is on the bottom. 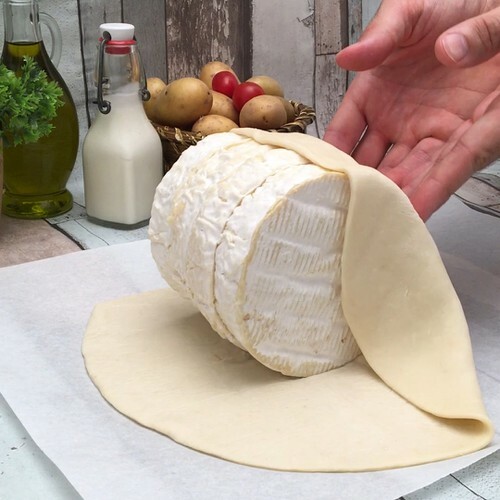 Wrap the cheese tower in the sheets of pizza dough until they are evenly covered. Place the wrapped cheese in an oven dish and add the potatoes around it, and drizzle them with olive oil and season with salt, pepper and mixed herbs. Bake at 140°C for 1 hour. Once baked, cut the pastry top off the tower and garnish with a little chopped parsley and black pepper. Enjoy by dipping the potatoes into the cheese fondue.